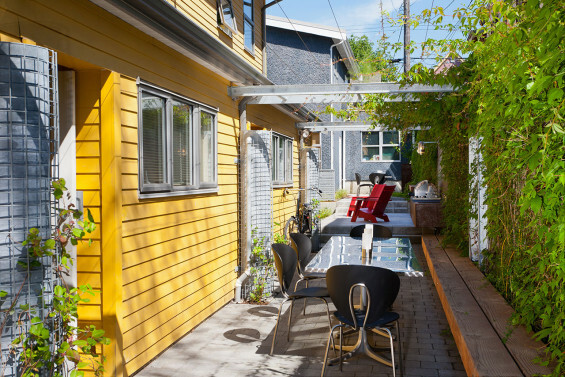 Tying together six townhouses on the site of an old autobody shop in Vancouver’s Strathcona neighbourhood, Koo’s Courtyard provides a small community with its social heart. The design challenge was to make a virtue of the narrow space, which has a width of 2.8m for most of its length. 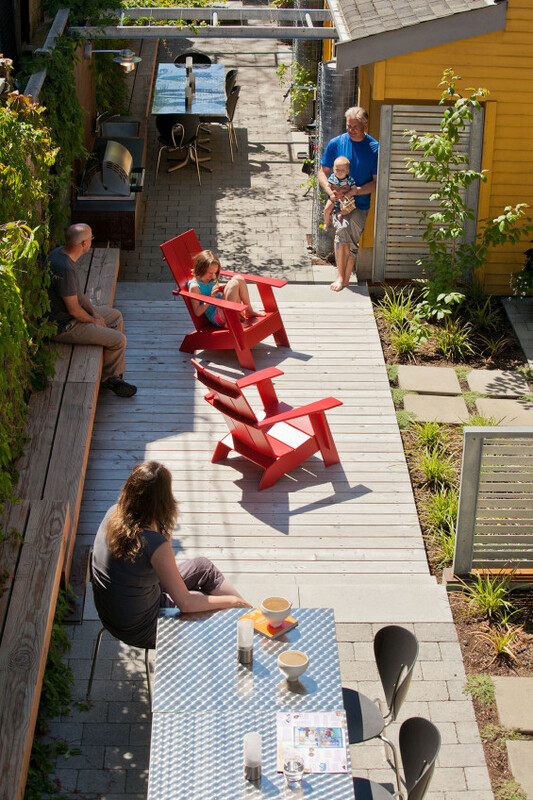 With six fenced private patios, overgrown shrubs and bulky stormwater barrels, the dysfunctional existing garden area left little room for anything else. The designers’ first move was to clear the clutter and reveal the potential for communal use. In this respect, they were privileged to work with an enlightened client group that was ready to move from the typical backyard archetype to a new social paradigm. 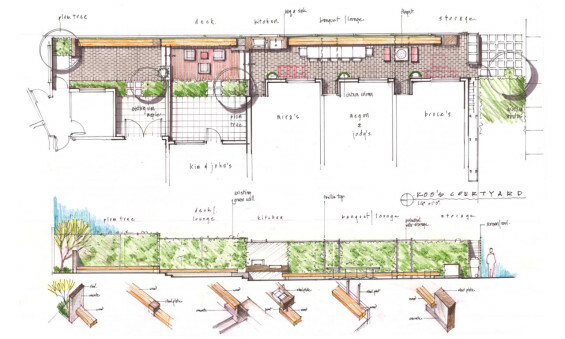 The courtyard design transforms several small, underused patios into one layered, shared amenity space. 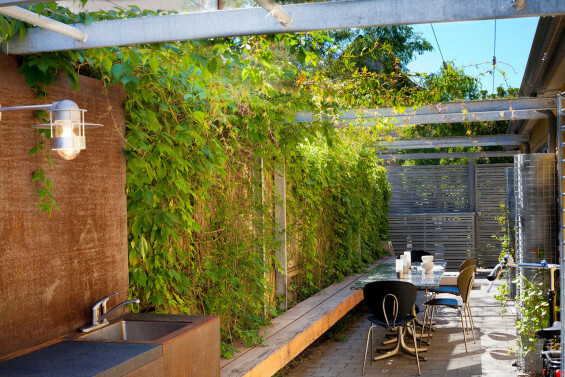 A long hemlock bench skirts along the east edge of the courtyard, affording informal seating and playing on the site’s perspective. Two sets of steps resolve grade change and foreshorten the long view. 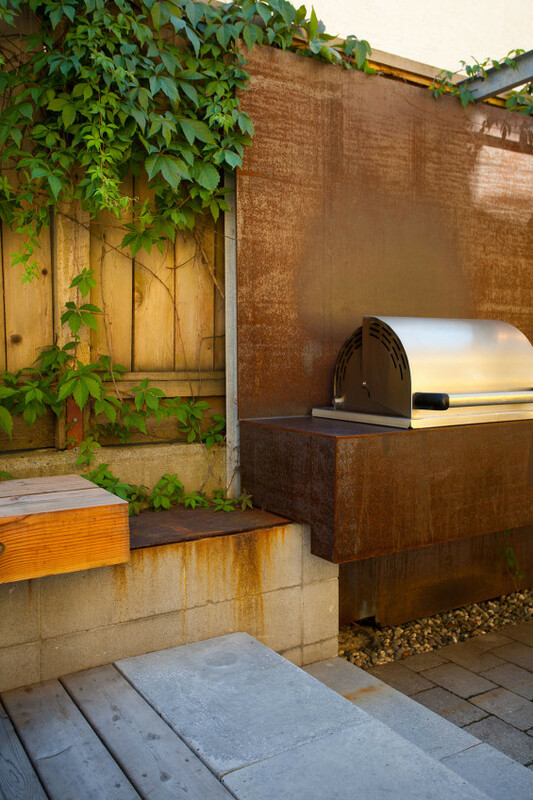 The bench ties together related zones of use: a back terrace, a wood deck, a kitchen area, banquet seating, and a firepit. A pergola unifies the latter three spaces, modulating the overhead plane and further breaking up the length of the site. In a small, wider section of the courtyard, separate private patio space is subtly defined by a band of planting and stepped stones. Environmental considerations have been deftly woven into the design. 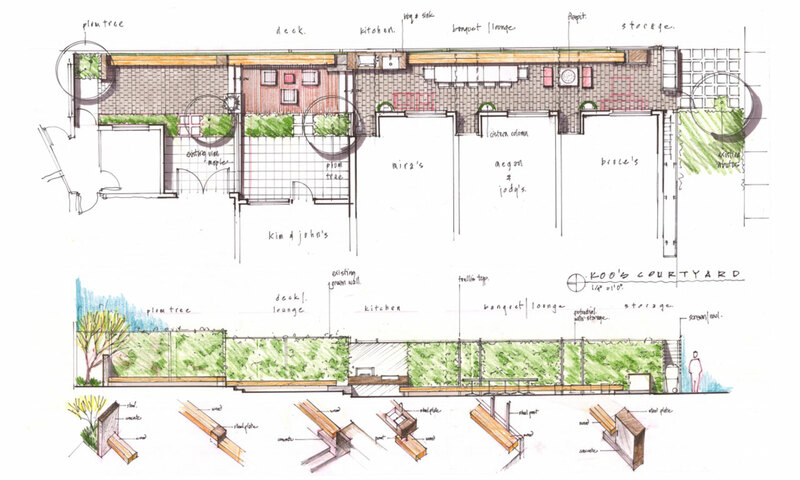 Five custom barrels fit within a tiny footprint along the townhouse walls, providing stormwater through gravity-fed hose bibbs and emphasizing the site’s industrial aesthetic. An infiltration zone at the courtyard’s margins absorbs excess stormwater. 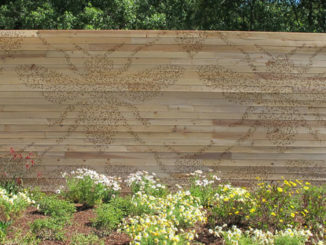 Other green components include locally-sourced hemlock benches and cedar decking, the incorporation of existing trees and vines into the courtyard, and two plum trees that, once established, will yield edible fruit. The built courtyard has achieved the goals of the clients and the designers. 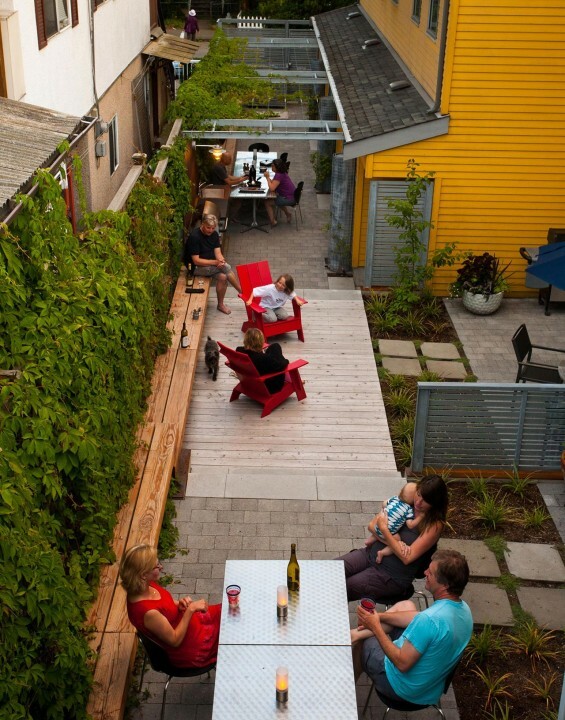 Where there were once isolated, crowded yards, there is now a coherent communal space that is treasured, enjoyed and well-used by its owners. 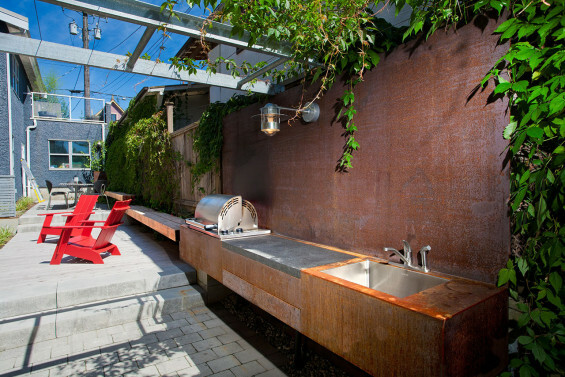 Distinctive components of the courtyard include the locally-sourced bench, for which hemlock, a material not usually seen in exterior construction, was used. 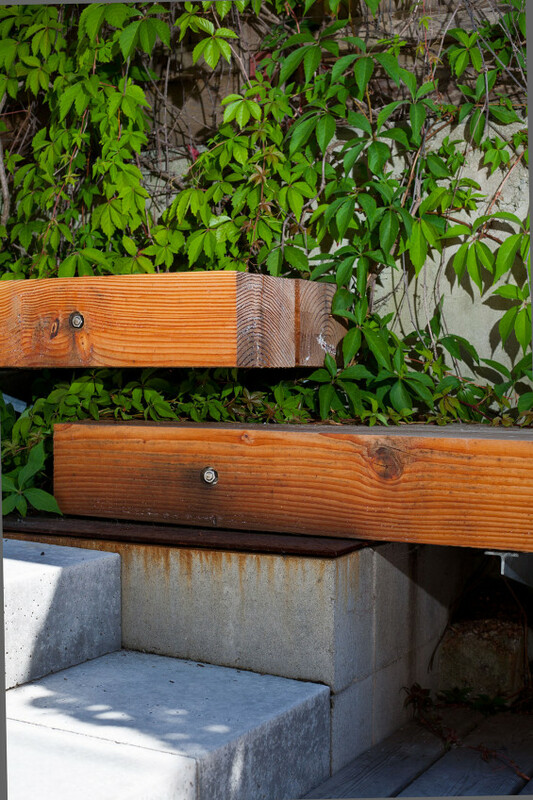 The stormwater barrels were custom designed for the site’s severe space constraints, and locally fabricated to the designers’ specifications. The water column in each barrel creates water pressure in the hose bibbs, eliminating the use of external power. All hard paving materials are locally fabricated, to minimize on transportation costs, and precast, to simplify construction within the constrained site. Metal elements including the pergola and the kitchen wall are galvanized or weathered steel, to fit with the industrial aesthetic of the building and the site’s history as a garage.